Dean Sakamoto, above, curator of an exhibit on the work of the late architect Vladimir Ossipoff, wanders through a breezeway surrounding the Goodsill House in Kahala, designed by Ossipoff and built in 1952. Dean Sakamoto is a man of many dichotomies. He's a local boy from Moanalua who deeply loves Hawaii, but he's also a high-powered architect who lives and works in Connecticut. He's an academic who teaches at Yale and runs the school's architecture exhibitions; on the other hand, he's right in the field, heading up his own firm. » Admission: $10; $5 students, seniors, military; children free. Free admission the first Wednesday and third Sunday of each month. Sakamoto also describes himself as "a forward thinker -- I don't look back, just ahead." Yet he's spent the last four years of his life immersed in the past. The architect is in town to install "Hawaiian Modern: The Architecture of Vladimir Ossipoff," an exhibit that centers on the work of a principal figure in the evolution of Hawaii's building aesthetic. Another reason for Sakamoto's regular treks from Connecticut is a project on Kauai that perfectly articulates his forward thinking. The National Tropical Botanical Garden is building the $12 million Juliet Rice Wichman Botanical Research Center, and Sakamoto is designing it. Slated to open in January, the center will house a research library, herbarium, lab and education and research spaces. 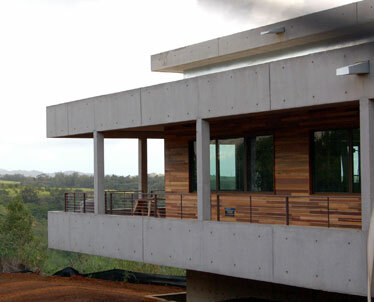 It also will be Kauai's first sustainable building. Ossipoff's design for the home, like so many of the buildings he designed in Hawaii, was meant to incorporate surrounding natural elements. Years living in Japan left the architect with a strong sense of the Japanese concept of "shibui," an understated aesthetic, that no doubt led to his frequent use of the lanai in island buildings. The 20,000-square-foot cast-concrete structure, built to withstand Category 5 hurricane winds and last 100 years, features recycled hardwoods and what Sakamoto calls an "active rooftop": It's designed to catch rainwater for irrigation and houses panels to generate 15 percent of the building's electrical needs. "It's a low-profile, two-story building that has as little impact on the site as possible," Sakamoto says. "A sustainable design means we're using as little resources as possible to minimize the building's footprint." Chipper Wichman, director and CEO of the garden, says the structure addresses more than just the organization's conservationism. "We felt it was critical that the building ... raise the bar not just for green architecture, but for what it means to construct buildings on this island." Serendipitously, Sakamoto's work will join three existing structures designed by Ossipoff himself. And the new building reflects some of the best principles Ossipoff employed. "I learned from Ossipoff how to situate in landscapes," Sakamoto explains, describing how his minimalist building appears to be one story but is really two because it stands on a slope. "And the major components (of the concrete) are sand and aggregate from Kauai," he says, following another practice Ossipoff believed in: utilizing resources of the area. "Ossipoff's work resonates with my own aesthetic response to design problems," Sakamoto says. "It's an approach informed by a process of simplification and the notion of (the Japanese aesthetic) 'shibui' -- given over to a higher order." Sakamoto's study of Ossipoff's work has informed his own sense of design, as indicated in his plan for the Juliet Rice Wichman Botanical Research Center, under construction on Kauai. 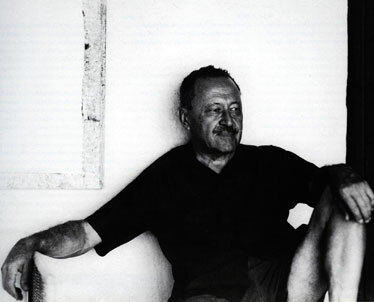 The bottom line regarding Hawaii architect Vladimir Ossipoff is that, ironically, his Modern buildings are timeless. Ossipoff's heyday came during the post-World War II era in Hawaii, when change and optimism ruled. His work personified the massive transfor- mations taking place socially, economically and politically, when economic opportunities abounded and a burgeoning Democratic Party was unseating plantation-era Republican dominance. "Modernism was not just a style, but an outlook," says architect Dean Sakamoto, curator of "Hawaiian Modern: The Architecture of Vladimir Ossipoff," running Thursday through Jan. 27 at the Honolulu Academy of Arts. Ossipoff and other top isle architects provided the state with a new architectural identity that was sophisticated and clean, with simple forms based on function. Their work stood in stark contrast to Territorial-era buildings like the Royal Hawaiian Hotel and the Alexander & Baldwin building, which "tended to stand out, objectlike and proud, symbolic of the colonial power structure that commissioned them," Sakamoto writes in the exhibit catalog. Over almost 70 years, Ossipoff contributed hundreds of structures, both private and public, to Hawaii's landscape. Those include the Goodsill, Blanche Hill and Pauling homes, the University of Hawaii Administration building, the IBM building and the Honolulu Airport terminal. Yet for all the ways Ossipoff's structures reflected the sign of the times, "the best Ossipoff buildings are impossible to date because they still feel so appropriate," says Sakamoto. For Ossipoff, achieving appropriateness meant designing structures specifically for the environment and lifestyle of Hawaii. Thus, he spent his entire career marrying modern methods with local conditions using local materials, to create buildings that merged the indoors with Hawaii's glorious outdoors via lanais and opportunely placed windows and skylights. His thoughtful designs utilized tradewinds to keep his buildings cool without air conditioning and articulated his ability to create graceful structures along inclines, which minimized impact to the land. When he received international attention in well-known architectural journals of the day -- including House Beautiful, Casabella and L'Architecture d'aujourd'hui -- Ossipoff corrected the global attitude that "even in way-out Hawaii, you can still do Modern architecture," Sakamoto says. "Ossipoff said no, that his architecture was instead tailored to Hawaii." And for his practices and sensitivity to the environment, Ossipoff is especially relevant in today's reality of sustainability. Architect Vladimir Ossipoff designed some of Hawaii's most striking buildings. OSSIPOFF was born in Russia in 1907 to a military attaché for the czar who was assigned with his family to Japan. In 1923, Ossipoff moved with his mother, brother and sister to California. His father, who stayed on in Japan, was killed in an accident shortly after their departure. Ossipoff graduated with an architecture degree at the University of California-Berkeley and moved to Honolulu. Hawaii became his permanent home, and he died at age 90 in 1998. Sakamoto says Ossipoff's years in Japan left him with a strong sensibility for "shibui," an understated aesthetic that, along with Ossipoff's frugality and love of nature, informed his style and undoubtedly contributed to his mastery of the lanai concept. "Ossipoff once said that the ideal house in Hawaii is an umbrella. That, in essence, is the lanai," says Sakamoto. "(It) goes back to the hale complex, where there was one closed grass shack and a thatched roof held up by four columns. 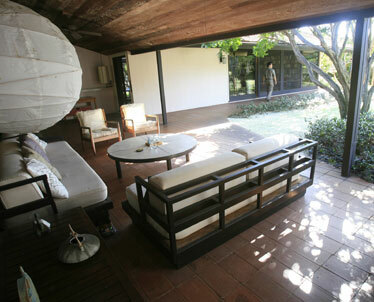 But the lanai itself is in essence a nonbuilding, and it takes restraint to create. ... It's about creating a structure so great that it's not even noticeable." Some of Ossipoff's most notable lanai structures include the Outrigger Canoe Club, which Sakamoto says was so skillfully designed that "if you ask anyone to describe what the building looks like, they'll have trouble," and the Honolulu Airport terminal, through which Ossipoff "fully manifested the lanai structure." The design takes full advantage of Hawaii's year-round sunshine and trades and "creates an open, airy and casual yet dignified gateway." 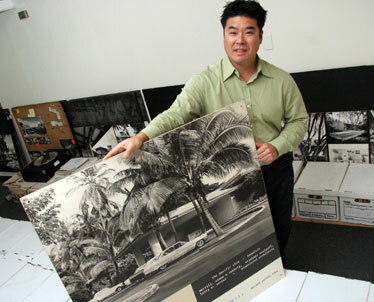 Curator Dean Sakamoto holds a photograph of an Ossipoff design, surrounded by boxes holding more examples of the architect's work. SAKAMOTO has long been influenced by Ossipoff's work. 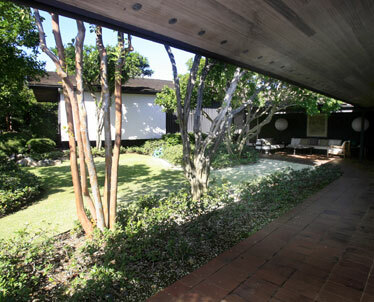 It was while seeking inspiration for several of his own Hawaii projects that Sakamoto decided to create the "Hawaiian Modern" exhibit. "I couldn't find any information on Ossipoff's work, so I approached his former partner Sid Snyder," he says. It turns out Snyder had kept dozens of boxes of Ossipoff project plans and other documentation. Having access to that gold mine, Sakamoto put his years of experience curating architectural exhibits at Yale University to good use. Now, after four years of flying back and forth across the country, he opens the exhibit Thursday. "Hawaiian Modern" highlights 30 structures from Ossipoff's long career through archival photographs, original drawings, historical publications, architectural models and a documentary film. Next summer the exhibit travels to Frankfurt, Germany, to the Deutsches Architekturmuseum, renowned for its international architecture exhibits, and then in the fall to the Yale University School of Architecture Gallery in New Haven, Conn.
Sakamoto says the relevance of "Hawaiian Modern" lies in its illustration of the value of good buildings. "For architects the most important thing is to be broad thinkers. What we build impacts society, and we should always ask how we can improve society through the built environment." The exhibit does more than honor Ossipoff, he says. "This show lays the foundation of where to go next. It lets the world know Hawaii is a significant place to build. As far as sustainability, Hawaii is the perfect place to work so seamlessly with the environment. And sensitivity to the environment is of global interest." 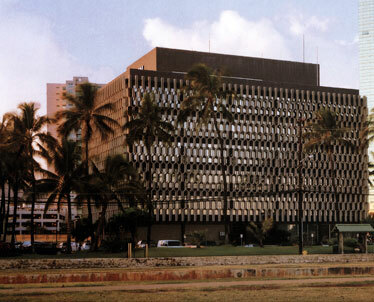 Ossipoff's design of the distinctive grille on the IBM building, built in 1962, conveyed the company's high-tech image, as well as Hawaiian geometric patterns. He angled the grilles so birds would not nest on them and so dirt or debris would wash away with rain. They have never required cleaning.